For decks, siding, windows and doors Sico ProLuxe provides a distinctively rich and vibrant finish. Sico ProLuxe premium wood stains and finishes are designed to provide unrivaled looks, durability and performance on all types of exterior wood. Find the perfect wood stain or finish to bring out the natural beauty of the wood in your project. Sico ProLuxe has a variety of stains and finishes suitable for exterior projects that deliver excellent protection and a high-quality finish. Many distinctive colours are available, from rich translucents that showcase the natural characteristics of the wood, to solids that complement a home’s exterior palette. It's important to prepare wood properly for a good result when finishing. Find proper surface preparation and application procedures to achieve a beautiful and water-repellant finish. 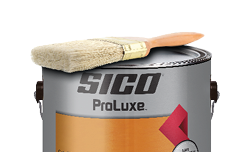 When it comes to professional coating products, the SICO® ProLuxe® name is known for superior quality. Our mission has been to provide high quality products that protect and enhance the natural beauty of wood. Sico ProLuxe products deliver a translucent furniture-like finish that complements the appearance of your home. Sico and ProLuxe are registered trademarks of PPG Architectural Finishes, Inc. © 2019 PPG Industries, Inc. All Rights Reserved. The PPG Logo is a registered trademark of PPG Industries Ohio, Inc.